A G2-class (moderately strong) geomagnetic storm may hit Earth on Monday or Tuesday, according to an alert issued by the National Oceanic and Atmospheric Administration (NOAA). Such storm could have noticeable impact on power systems, satellites, and could trigger auroras seen as low as New York and Idaho. 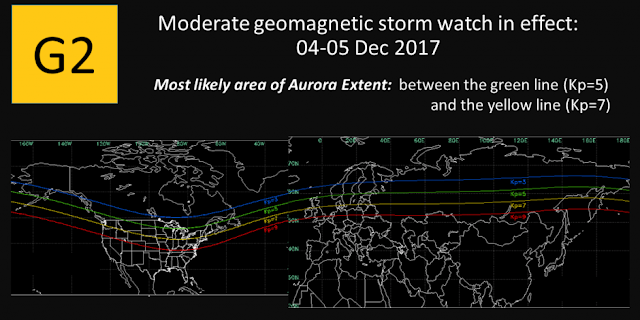 “G2 (moderate) geomagnetic storm conditions are likely on 04-05 Dec 2017 due to the anticipated influence of a recurrent, positive polarity CH HSS,” NOAA informed. NOAA underlines that geomagnetic storms are due to the anticipated arrival of a recurrent, positive polarity coronal hole high speed streams (CH HSSs). Fast CH HSSs can impact Earth’s magnetosphere enough to cause periods of geomagnetic storming to the G1-G2 levels; although rarer cases of stronger storming may also occur. The larger and more expansive coronal holes can often be a source for high solar wind speeds that buffet Earth for many days. NOAA also added that solar activity is expected to be generally at very low levels till December 23. However, one G1-class (minor) geomagnetic storm is expected around December 18. Hiking is one of the best entertainment, but we need to be careful also, timberland hiking boots review are for your comfort and to keep you safe from slipping. Best KSCAT Bone Conduction Headphones for your ears.